Honeycomb is harvested from beehives, along with bees and beehive husks. This ingredient is not in the VendorItemIngredient category that allows it to be traded by apothecary merchants (see bugs). The only way to make this ingredient become available from apothecary merchants is to unlock the Merchant perk (requires level 50 Speech), at which point it is a "common" ingredient. Peddlers may be randomly encountered in the wilderness (typically being attacked). These peddlers have a 25% chance of carrying 1-5 samples. Various ingredient-specific barrels have a 17% chance of containing 1-5 samples. Vaermina devotees have a 3% chance of carrying one. 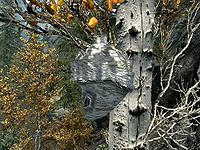 All types of apothecary's satchels as well as pots hanging from cooking spits have a 3% chance of containing one. Warlocks have a 0.9% chance of carrying one. 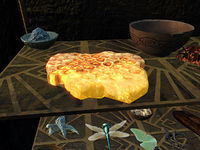 With the Dragonborn expansion, werebears may carry one sample of honeycomb. The base magnitude of the Fortify Block effect for this ingredient is 2 instead of 4. This is only relevant if honeycomb and Briar Heart are combined, in which case the resulting potion will have a 50% smaller magnitude than a typical custom Fortify Block potion. This ingredient cannot normally be bought from apothecary merchants, even though it should be available according to their merchandise leveled lists. It also cannot be sold to apothecary merchants; it can only be sold to general goods merchants. This page was last modified on 9 April 2018, at 04:57.